They are being called right-wing extremists who delivered a massive confrontation with police overturning their cars in Cologne on Sunday. The police turned to using water cannons, batons and tear gas, in an effort to break-up the demonstration (riot). Police officers were pelted with bottles, stones and firecrackers. 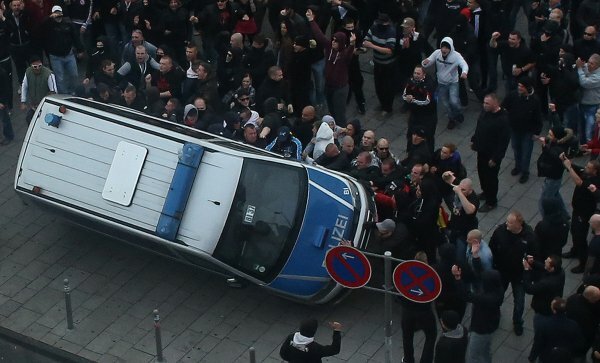 At least 13 policemen were injured, one seriously, according to various German newspapers. Such an escalation of violence has long since existed in North Rhine-Westphalia. The organizers had 1,500 people registered for a peaceful demonstration – there were at least 4,000 others that appeared who appear to have turned violent in real force to demonstrate against Islamists. The police are said to have brought in 1,000 men, but were greatly outnumbered.